Elementech 400 corrosion resistance. CE approved. Torx bit included in each tub. Please note items delivered by our suppliers are not available for the options above. Delivery times may vary. Order online or over the phone and collect in branch from 10 minutes later. Ensure you check stock is available for collection at your chosen branch. Check branch opening hours to ensure you have sufficient time to collect. For items not available for same day collection, place order before 8pm Mon-Sat (4pm Sun) and you can collect Next Business Day (Mon-Fri) after 3pm. If we have your mobile number, we’ll send you a text when your order is ready to collect. 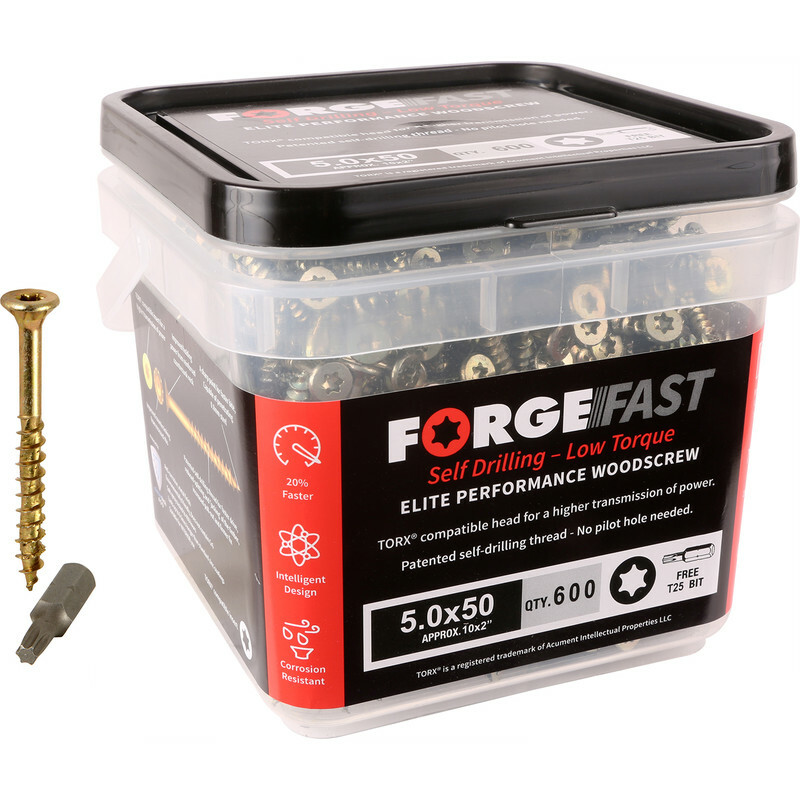 ForgeFast Multi Purpose Self Drilling Wood Screw Tub 4.0 x 50mm (900 Pack) is rated 4.8 out of 5 by 8. Rated 5 out of 5 by Mtwruk from Great Screws! These really are great. Performance is exactly as advertised. They screw in fast, and the torx head is much better than normal screw with the added bonus of the free bit. Very good value. Will be using again. Rated 3 out of 5 by Fleetwood from Cheap Screws Have used for some time but think the spec has been changed as they are not as good as they used to be. Rated 5 out of 5 by Bob142 from Good deal I bought these to put my fence up. Rated 5 out of 5 by Dennis69 from Quality screw Used these to fix lightweight timber joist brackets to timber bearers. Every screw drilled in perfectly aided with the included driver bit. Rated 5 out of 5 by Godofthunder from Does what it says on tub! Great screws. Just point and shoot. Rated 5 out of 5 by builder35 from Great quality Use to use Reisser for everything but this is far better self tapping option. Good for framing, torx head last forever in the impact driver (used 2000 screws in last 2 mnts) . The only situation where the PZ2 better where you have to drill in angle and there is a chance that the bit can pop out from the screw. You have items in your trolley that will be delivered directly from our suppliers. Expected delivery times for each item are noted on the trolley and checkout pages. Your order details will be passed on including your phone number so that delivery can be arranged for this item. Orders with multiple items will be automatically split between Toolstation and our suppliers. If you have any questions please feel free to call our customer service centre for free on 0808 100 7211 or 0330 333 3303 from mobiles.